With a name like this you’ve got to say it before you start drinking it, so fly high and enjoy the ride. Gotta admit that I LOVE Chef Aaron McCargo. When I saw this featured on his show Big Daddy’s House, I made it that second. I have tweaked his original recipe because the original could put hair on the chest of any woman and was too strong with the taste of vodka, but this stuff is pretty killer. 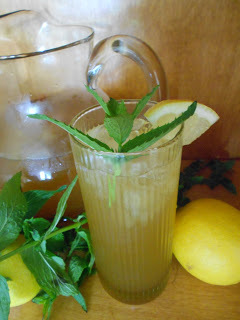 It combines iced tea, mint simple syrup, vodka and lemon and all I can say is YUM! 1) Place FRESH LEMON JUICE and sugar in a small pan. Simmer until sugar is melted. 2) Add mint leaves and muddle into simple syrup. 1) Bring water to a boil and add tea bags. Allow to steep. 1) Combine mint simple syrup, tea and 1.5 cups vodka in a pitcher. I have also used citrus vodka in this recipe. 3) Serve in a tall glass with plenty of ice and mint leaves/lemon slices as garnishes.